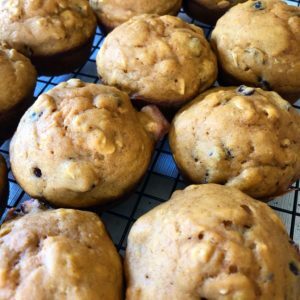 Once upon a time, in (what feels like) a galaxy far, far away, I had two wee babes and one tasty muffin recipe. Those babes are now 7- and 5-year-old elementary schoolers, and my muffin recipe has grown up, too. This newer version is a filling grab-and-go treat packed with nutrients and is fun to make with kids. This recipe is flexible, too. Add nuts or seeds for a little crunch and protein. Add more puree if you want to leave out the bananas or vice versa. Double the recipe to make a huge batch of muffins. They freeze well and make excellent hostess gifts. What are your ideas? How would you modify this recipe? Add dry ingredients to large mixing bowl. Then mix in eggs, bananas, squash/pumpkin, and oil. Finally, add milk until batter is easily stirred but not runny. Spoon into muffin tins. Bake at 375 for ~15 minutes or until done. You’ll know it’s finished when the top of the muffin springs back. Need to bake longer if your finger sinks into the muffin.